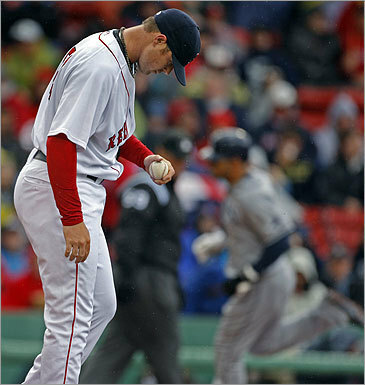 BOSTON (AP) It wasn't that long ago that the Tampa Bay Rays couldn't win in Boston. Now, they're the team that looks most comfortable during the past few rainy games. Matt Garza pitched shutout ball for eight innings, Carlos Pena and B.J. Upton each hit two-run homers and the Rays continued their hot road start with a 7-1 win over the Red Sox on Sunday. The Rays have won three of the last five series in Fenway Park after losing 25 straight. Sorry. There is no good news. Yesterday was another sorry affair at Fenway Park for the Red Sox, the only difference being this one was in the daylight. 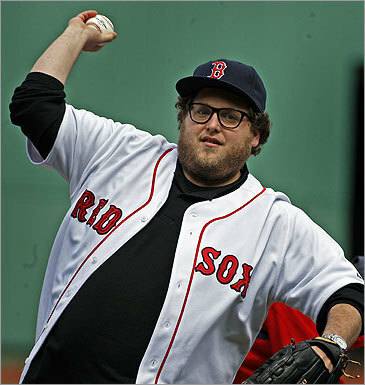 The Sox haven’t been able to defeat the Rays in the evening and they haven’t been able to beat them in the afternoon. Perhaps playing them in the late morning today will change their luck. The clubhouse was quiet, nearly empty. The mood appeared gray, like the clouds over Fenway Park, like the rain that had showered the Red Sox off and on as they lost their third straight game to the Rays, their fourth straight overall, moving them closer to the Orioles at the bottom of the American League East than the Yankees and Rays at the top. It wasn’t a perfect game, far from it. The Red Sox had three hits and drew a walk over the first seven innings against the Tampa Bay Rays yesterday. But thanks to three double plays and one base-running mistake, Matt Garza entered the eighth inning having faced the minimum 21 batters. “It was kind of cool, actually,’’ said Garza, a distinctive righthander who sports a patch of hair on his chin better suited for a billy goat.